Should the U.S. let its greatest adversary open up shop in southern California? While the U.S. has been paying attention to the G7 summit and the historic meeting between President Donald Trump and North Korean dictator Kim Jong-un, another event that could have a major foreign policy and economic impact on America is unfolding before our very eyes. A Chinese company with close ties to the Chinese Communist government is attempting to buy the company that runs the Port of Long Beach. Who is the company and why is this a bad idea? The Port of Long Beach is located in the city of Long Beach, 25 miles south of Los Angeles, Calif. It is the second-busiest container port in the U.S., behind its neighbor to the north, the Port of Los Angeles. The strategic location of the port makes it a critical component of U.S. trade with Asia. The port generates over $100 billion in trade and is responsible for over 30,000 jobs in Southern California. The port is also located in the heart of the U.S. military-industrial complex in southern California. To the south of the port lies the largest Marine Corps base, Camp Pendleton, and numerous Naval stations in San Diego. To the north, there are multiple sensitive Air Force bases including Edwards Air Force Base, which houses the Air Force Test Center (AFTC). The AFTC is a development and testing organization that has test flown every Air Force aircraft since WWII. To say the port is in a sensitive area would be an understatement. Orient Overseas Container Line (OOCL) is the Hong Kong-based company currently running the Middle Harbor property. In 2012, OOCL signed a 40-year lease worth $4.6 billion to develop the property. OOCL tripled the size of the port’s container capability, with over 2,000 vessels visiting the port processing 6.8 million container units. OOCL has been a good steward of the port with no controversy associated with the company. The other company involved in the equation is a Chinese conglomerate. China COSCO Shipping Corporation Limited is a state-owned firm based out of Shanghai. The company has dozens of subsidiaries and divisions focusing on logistics, shipping, equipment manufacturing, financial services and information technology. In July last year, the Chinese company submitted a bid to purchase OOCL for $6.3 billion. Why is this such a big deal, many might ask? It is just one big international shipping company buying another. China COSCO is the problem. When doing business with a Chinese mega-corporation, you are also doing business with the Chinese government. Is it smart to put China, the greatest geopolitical threat to the U.S., in one of the most strategic ports in the country? This fits a pattern of China using its economic might to purchase influence around the world. As many around the world know, Greece is in a dire financial situation. Sensing this, in 2016, COSCO purchased a controlling interest in the Piraeus Port Authority. The port serves Athens, is the largest Greek port, and one of the largest in the Mediterranean. China wouldn’t wait long to exercise its power. Last Summer, the European Union attempted to criticize China’s human rights record and treatment of activists and dissidents at the United Nations Human Rights Council. However, Greece refused to join the rest of the EU, marking the first time the union failed to make its statement at the U.N. Greece called the action “unconstructive criticism of China.” This is what flexing economic muscle looks like. There is nothing wrong with one company buying another. There is something wrong with letting America’s greatest adversary into the heart of the southern California military-industrial complex. The Committee on Foreign Investment in the United States should immediately move to block the sale. China would never allow the U.S. government to operate the Port of Shanghai, why should the U.S. allow China to do the same. 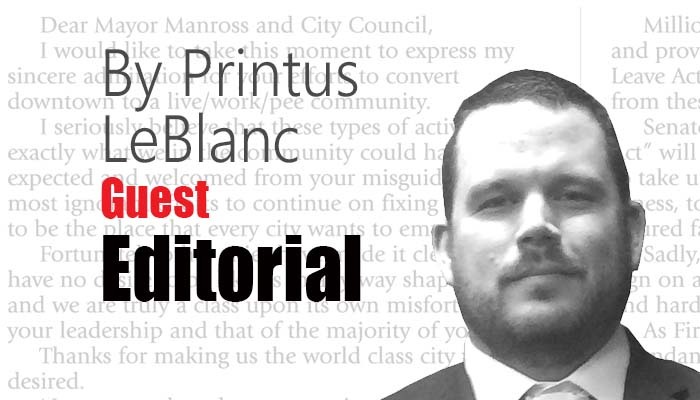 Printus LeBlanc is a contributing editor at Americans for Limited Government.